A 12 oz. New York Strip Steak topped with a Crimini mushroom, and black pepper demi-glace. Served with garlic mashed potatoes. 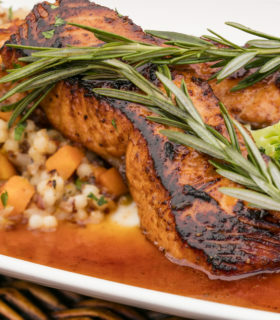 Fresh, marinated and pan-seared Atlantic Salmon, glazed with sweet and spicy honey Sriracha sauce. Served with a side of vegetable quinoa. A 10 oz split Red Bird Chicken Breast grilled with a honey chipotle glaze and topped with queso fresco crumbles. Served with poblano Spanish rice. 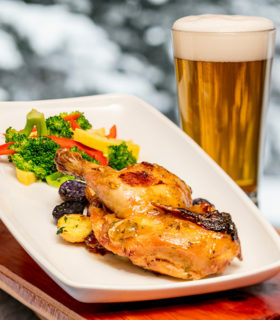 Pub Dinners are served from 5 – 10 pm. All meals, with the exception of the pasta dinner, are served with vegetable and accompaniment. Add a brewhouse salad or soup du jour for $2.25. A 12 oz. 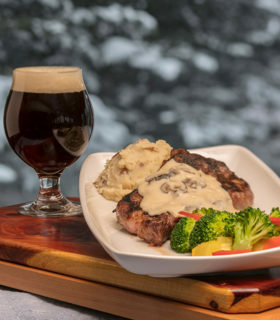 cut of marinated, slow-roasted Prime Rib served with au jus, creamy horseradish, and a baked potato. Asian marinated Flank Steak served medium and topped with a sweet Thai chili sauce and a wasabi cream sauce. Served with garlic mashed potatoes. An 8 oz. rubbed and grilled boneless Pork Chop with a roasted poblano cream sauce and avocado. Served with Spanish rice. Bison Tenderloin Tips marinated in a light brown ale and soy sauce then pan-seared. Served over mushroom risotto. Alaskan Cod covered with a tomato, basil pesto breading and baked in white wine. Served with vegetable quinoa. Red meat Trout filet finished with a lemon dill cream sauce. Served with vegetable quinoa. Linguine pasta with cream, egg, roasted garlic, Crimini mushrooms, bacon and peas. Served with garlic toast. Vegetarian option: order with no bacon. Regarding the safety of these items, written information is available upon request: Consuming raw or undercooked meats, poultry, seafood, shellfish or eggs may increase your risk of foodborne illness.